Posted on November 2, 2016 at 10:41 am. Leo Vegas wants to help you make it to grandmas offering a free spins giveaway on NetEnt’s new pokie for the next 24 hours. Up until 12pm tomorrow players can score up to 200 free spins on Fairytale Legends: Little Red Riding Hood by playing live dealer roulette at Leo Vegas casino. Head to the live lobby and open up NetEnt’s live roulette title, play 20 rounds before 12pm AEDT today to score 100 free spins. You can then earn an extra 100 free spins by playing another 20 rounds on live roulette between 12am to 12pm AEDT tomorrow. A qualifying round on the live dealer roulette table is a real money wager featuring less than 70% of the available outcomes on the wheel. More than 70%, such as placing a bet on both red and black, will not qualify. You will then be awarded with your free spins the following day to use on the brand new pokie. You do need a real money account in order to play live dealer roulette so if you aren’t a member of Leo Vegas online casino yet sign up and make a deposit with Visa, MasterCard, Neteller, Skrill or via a bank transfer. Net Entertainment have moved into the fairytale genre, following their successful foray into the music category. To commence the range of pokies featuring themes reminiscent of our childhood is Little Red Riding Hood. 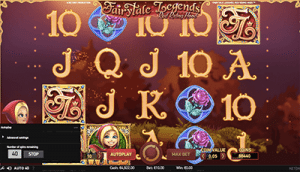 The pokie features 20 paylines and the magic begins as soon as you open the 5 reel title. There’s 10 bet levels available and the RTP is 96.33%. While the animations are quite beautiful and incredibly detailed it’s the bonus features which really have our attention. There’s three mini bonus features including the Fairy Magic Spin, the Fairy Surprise Random feature, and the Fairy Wild Spin. Each are available in the base game and feature huge payouts. Then there’s the three big bonus features you can pick from by spinning three Bonus symbols. You can choose from the Beware the Wolf, where you can win up to 200x your initial stake; the Free Spins, with up to 10 available and 10 more eligible to be re-triggered; and a coin payout of up to 15x your bet. The features and animations are incredible and you can try it out for free by winning free spins on the pokie at Leo Vegas online casino. If you are visiting us from United States, you can also win free spins and play the latest real money pokies game releases at Raging Bull Casino.